One of the things I often do as I'm reading a novel or short story is keep track of words whose definitions I do not know or that I find interesting. Either way, these interesting words are ones I feel might be of use in my own writing. That, and it's good to expand one's vocabulary every once in a while. Read my review of The Alchemist's Pursuit. condottiere: A military adventurer of the fourteenth and fifteenth centuries, who sold his services, and those of his followers, to any party in any contest. patriciate: The patrician class; the aristocracy; also, the office of patriarch. sausage stands: I know what a sausage stand is, but thought it interesting that Renaissance Venice had them (or at least Duncan's rendition did). sortilege: The act or practice of drawing lots; divination by drawing lots. 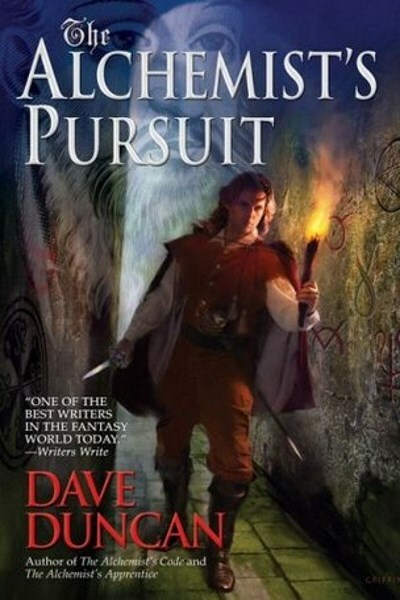 The Alchemist's Pursuit by Dave Duncan is the third of his tales involving Nostradamus and his resourceful and daring apprentice, Alfeo Zeno. This time the Maestro is called upon by Violetta, courtesan and friend to Alfeo, who informs the pair that a dear friend of hers has been murdered. An impossible case—the woman was killed weeks ago, there are no witnesses, and the body spent considerable time in the water—turns into something much larger as the murders of other courtesans come to light and soon intersect with the guilty party in an eight year old patricide long thought solved. So begins the latest installment in Duncan's Venetian fantasy/mystery series. The story follows the basic path set in the previous two novels, with Nostradamus being called on to solve an unsolvable crime and Alfeo, our narrator as always, charged with the elder Maestro's legwork. In this novel, however, we see Alfeo grow in new ways we’ve not seen before. Not only does he demonstrate an increased aptitude in the working of magic, but he also displays a newfound ability to navigate the perils of Venetian society and its politics. Descended from nobility, Alfeo's name is written in the Golden Book, though the family fortune long dried up and so he employs himself as an apprentice and assistant to Nostradamus. Trained in the "dark arts," it is a fine line master and apprentice walk, for Venice is a Christian city, and so witchcraft is outlawed and its practice punishable by death. Yet the magic in Duncan's Alchemist novels is very subtle. In The Alchemist's Pursuit, besides for the usual divinations for which Nostradamus is famous, much of it culminates in the presence of a cat which assists Alfeo at times, though Alfeo suspects he may have attracted the attention of a demon who is helping him only to gain his confidence. It is a sometimes harrowing, sometimes humorous unfolding in which we finally learn the true purpose of this feline spirit. As for the murders themselves, we soon learn that not one but three courtesans have been slain. A divination by Nostradamus shows that they are only the beginning, and so Alfeo must track down witnesses, avoid the law which has expressly prohibited Alfeo from investigating the crimes, and protect the woman he loves, Violetta, before she becomes the next victim. All in all, The Alchemist's Pursuit is yet another gripping tale set in Dave Duncan’s (mostly) historically accurate Venice of yesteryear. Duncan's style is top-notch and his prose worthy of study (not in the literary sense so much, but more in the 'this is how modern fantasy tales should be written' sense). While I've had limited exposure to Duncan up to this point, it's books like The Alchemist's Pursuit that make me want to seek out other novels by the author. Also, I hope this is not the last we've seen of Alfeo and his irritable master. With such a marvelous setting and intriguing characters, I think Duncan has many more tales to tell in this world. Read my review of The Alchemist's Code. I was able to make note of quite a few while reading Dave Duncan's The Alchemist's Code simply because Duncan was pushing my vocabulary knowledge at almost every page. Kindle's annotation feature made this process very easy; no more pen and paper notes. I especially like that I can sync all of my annotations to the Kindle for PC app I have running on my laptop. That way I've got the information right there on my screen as I'm, say, writing this post. Here are the words with definitions that I found interesting. 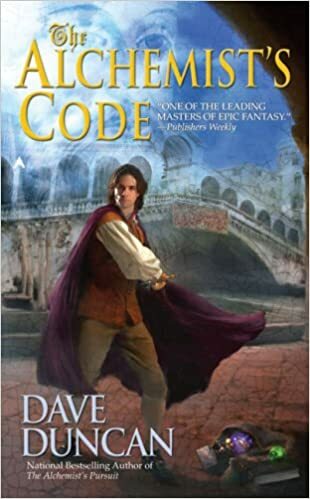 The Alchemist's Code is the second in the series of fantasy/mystery tales penned by Dave Duncan and set in the historic, beautiful, and oftentimes dangerous world of 16th century Venice. I reviewed the first book in the series, The Alchemist's Apprentice, not too long ago, and since I found that first book such an enjoyable read, I was eager to jump into this one. Once more, Alfeo Zeno is our narrator as the ruling body of Venice, the Council of Ten, calls upon Alfeo's master, Nostradamus, to crack encoded messages which they fear contain state secrets. Espionage, a lover's tryst, and a friend from Alfeo's past become intertwined as Alfeo must face down a supernatural threat and his own execution for practicing witchcraft as he is forced to invoke supernatural powers of his own to stop the spy's machinations. Much like its predecessor, The Alchemist's Code is beautifully written. Duncan does his best to display his command of the written word with eloquent prose and a plethora of words that had me reaching for the dictionary a couple of dozen times. The Alchemist's Code was the first eBook I purchased for my Kindle; the built-in dictionary was a godsend. Alfeo's descriptions of the political and social aspects of Venice are more terse in this book as compared to the previous novel. The same goes for his telling of ancillary characters. In other words, Duncan assumes we've read the first book in the series and don't need this information in as much depth this time around. The doge (the leader of Venice, sort of like a duke but without the power) plays a smaller role in this second book, and his relationship to Alfeo as well as their history does not play the part it did in book one. The same goes for Violetta, Alfeo's lover who also just happens to be a prostitute to members of high society. Filiberto Vasco, however, plays a major role in this novel. Vasco is Alfeo's chief adversary in government, and the one who would most like to see Alfeo burn at the stake for witchcraft. Duncan never goes into great depth regarding this rivalry, though it can likely be attributed to professional jealousy. That, and the two grew up together, and so they share history. All that being said, while reading the first book in the series will give you good background information about these extra characters and the setting, it is by no means necessary to have read that first book before reading this one. Still, there's also no reason not to; both are well-worth the read. Duncan once again does a nice job with characterization. Alfeo is a likeable, personable, and sometimes humorous narrator. Nostradamus is aloof, stubborn, seemingly oblivious to the fact that he is tempting fate by challenging Venice's authority but always with an ace up his sleeve. Even Vasco, who makes no secret of his desire to see Alfeo trip and fall, shines through because of his loyalty to the state and underlying desire to do (what he thinks, anyway) is right. 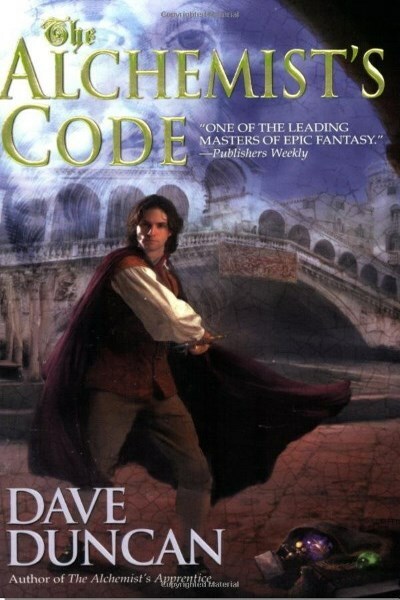 The Alchemist's Code is a well-written, enjoyable read, full of mystery, intrigue, and action. I'll be picking up the next in the series, The Alchemist's Pursuit, soon . Maestro, doctor, alchemist, seer. Nostradamus is all of these things in The Alchemist's Apprentice by Dave Duncan. Such stature is not always of benefit, though, for when Nostradamus foretells an untimely end for a well-to-do government official and that official winds up dead—murdered by poison—Nostradamus himself is suspected of perpetrating the crime to enhance his own reputation as a soothsayer. Now, it's up to the Maestro's assistant, Alfeo Zeno, to clear his master's name and keep the both of them free of Venice's particular form of justice, for Alfeo knows that if his master is found guilty then it's over for him as well. So begins The Alchemist's Apprentice, a beautifully written fantasy/mystery tale set in the grandeur of 1500's Venice. Duncan's Venezia does differ from the real one in some ways. For one, magic is real, and while its practitioners are persecuted by the church, this stops neither Nostradamus nor Alfeo from its practice. But it is a fine line the two of them walk, for while Nostradamus has the ear of the Doge (pronounced 'doj'), there are others in the government who would like nothing better than to expose Nostradamus as a fraud. The Alchemist's Apprentice is told in the first person narrative, with Alfeo Zeno as our storyteller. Alfeo is a twenty-something descendant of the highest nobility whose family name is written in the "Golden Book." But generations ago the Zeno's fell on hard times; while Alfeo carries himself as befits his station, he does not lead a life of leisure. As the apprentice of Nostradamus, he works hard as a scribe and gopher while sharpening his Tarot card reading skills under the watchful eye of his master. Alfeo also serves as the eyes and ears of the elder Nostradamus, something which the Maestro takes full advantage of in trying to clear both their names. While the back cover description makes it sound as if Alfeo is the one leading the investigation, it is really Nostradamus pointing him in the right direction and steering him back on course the few times he strays from the path. But it is most certainly Alfeo who finds himself most at risk as he becomes embroiled in the politics of Venice and especially as he closes in on the real killer. In terms of style and language, The Alchemist's Apprentice is a thing of beauty. I certainly do not mean that in a literary sense; you won't be overloaded with uselessly elegant prose. But it is a testament to good writing that really helped set the tone. Keep your dictionary close, too; you'll likely need it at least a little. 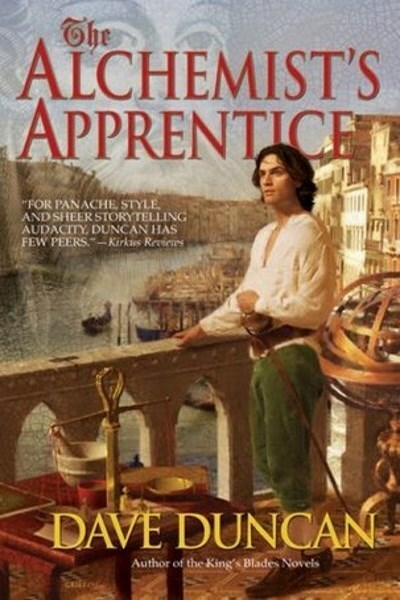 Duncan picked an excellent setting for his tale, weaving in the dangerous politics of Renaissance-era Venice with the often foreboding, mysterious reputation of Nostradamus. Alfeo provides the light in that darkness and the grounding for the reader, especially as the tale is told from his perspective. Through him, we are introduced to the many different sides of life in Venice, from the highest via his visits to the Doge's Palace (which is adjoined by the torture chambers and prison from which Casanova escaped) to the lowest when he enters the Jewish Ghetto (where Jews were virtually imprisoned from sunset to sunrise). This tale was all the more poignant for me because my wife and I just visited Italy, including Venice, earlier this year. I can tell you that I was hanging on Duncan's usages of the Doge's Palace, the prisons, the Golden Staircase, and, of course, the Piazza San Marco and Basilica di San Marco. This is the sort of book I would have loved to have read before our trip to Venice (perhaps both before and after would be best). Duncan also does a fine job with his characters. Nostradamus is just what you might expect: aloof at times, often mysterious, but always with a hint of mischief about him, as if he knows something no one else does (oftentimes, that is exactly the case). Alfeo is likeable and an easy narrator to follow along with. Other characters include a colorful ensemble of house assistants and Nostradamus's personal gondolier, whose two sons add some levity. The Alchemist's Apprentice is the first of three books in this Venetian fantasy/mystery series. The second is The Alchemist's Code , and the third, The Alchemist's Pursuit . I thought this first book was an enjoyable read and I'm looking forward to reading more tales of Alfeo Zeno and "the Maestro."